Honey is an amazing thing, and it makes a fine alcoholic beverage, but it does have one little problem. Unlike grapes or barley, honey is a nutrient-poor substance. It lacks some of the necessary compounds and elements that yeast needs. What this means for mead-making is that if you try to ferment honey and water alone, the yeast will often become stressed, stop fermenting too soon and start producing undesirable off-flavors. This commonly appears as burnt rubber or rubbing alcohol flavors in the young mead. Often these bad flavor compounds will diminish with time, but by treating your yeast well and keeping them healthy you can avoid them altogether. Here's what you need to know about nutrients and mead. Honey especially lacks a source of nitrogen. 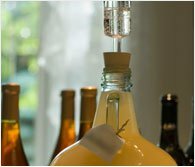 Mead makers counteract this by providing the fermentation with Diammonium Phosphate during the first few days. A simple nitrogen source such as this is usually called Yeast Nutrient. There are many other nutrients that yeast need in smaller quantities. Our Yeast Energizer is an excellent supplement to the Yeast Nutrient. Together they can supply everything that the yeast needs to keep going and stay healthy. For many years brewers just added all of the required nutrients at the start of fermentation. More recently it has become common practice to split the nutrients into smaller amounts and add them at intervals during the first few days of fermentation. Spreading out the nutrients in this way is called "staggered nutrient additions", and it helps keep the yeast healthy and reduce off-flavors. Our 5-gallon mead kits recommend adding 1/2 teaspoon yeast nutrient and 1/4 teaspoon yeast energizer at the beginning of fermentation and adding the same amounts once per day for the following 3 days. Be careful when adding dry powders to fermenting mead! The sudden release of co2 can cause the mead to foam out of the fermentor. Removing a small portion of the mead to combine with the nutrients first can help, as can stirring to release co2 before adding the nutrients in.